Agriculture Minister Michael Creed told TheJournal.ie that he has been consulting with people in the microbrewery industry on how to boost business even more. THERE COULD BE good news in this year’s Budget for craft beer makers. Agriculture Minister Michael Creed told TheJournal.ie that he has been consulting with those in the microbrewery industry on how to boost business even more. In the last three years, microbrewery beer production has increased by 550%. According to the Irish Brewers’ Association (IBA) annual report in the last year, beer output has increased by 6% – rising from 730 million litres to 750 million litres. Two years ago, Finance Minister Michael Noonan made special provisions for microbreweries in the Budget by increasing excise relief for the sector. However, the Vintners’ Federation of Ireland said it was disappointed excise duty was not reduced last year, calling it “a missed opportunity”. The annual excise relief production ceiling for microbreweries was increased from 20,000 hectolitres to 30,000 hectolitres. “We are looking to build on those,” said Creed ahead of next month’s Budget. We are always looking at ways to help the industry, but bear in mind it is an industry that is doing very well already. But we are conscious of the issues and the asks and we have had consultations with them on how we can assist. He said the industry was experiencing impressive growth in recent years. It is estimated that there are 63 microbreweries operating in Ireland, of which 48 are production microbreweries and 15 are contracting companies. A 2015 report by the Independent Craft Brewers of Ireland found that 22 new production microbreweries commenced production in 2014. By end of year 2015, the total number of production microbreweries may have risen to approximately 58. The turnover of craft beer producers in 2014 is estimated at €23 million and at a projected €39.6 million for 2015. 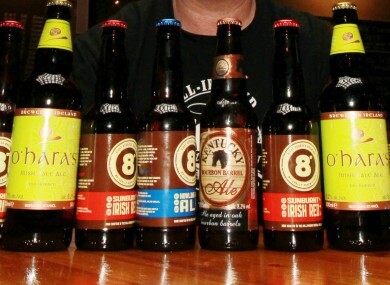 Five microbreweries had a turnover of more than €1 million in 2014. Creed said it is one of the areas that is performing well, which is positive news for tillage farmers. We have a real issue in the tillage area. Tillage farmers have been really suffering for a number of years and I am very conscious of that and I am trying to work through with them on that. That is one of the bright areas for the tillage sector because obviously they are a critical ingredient in the distillery and brewery business. It is now a good news story, he added. Email “People who make craft beer might get a happy boost in the Budget”. Feedback on “People who make craft beer might get a happy boost in the Budget”.